Thankfully there were people like Dustin at Burning Man. Guys hired by the festival to drive the sewer trucks around and remove the waste for a fee from festival attenders. The live in RV’s on the outskirts of camp, have their meals catered and spend 12 hours a day cleaning other peoples excrement. While walking to one of the potties my friend Rick and I were discussing the problematic poo potentency from our own RV when we spotted Dustin’s truck. Rick flagged him down while I went to use the porta-potties and when I emerged Dustin invited us to hop in his truck to drive to our RV and clean it out even though it was out of his district. next time, we will only use the RV bathroom for applying makeup! At one point in the week we realized a gift we had to offer to the Burning Man community was prayer. Prayers of blessing, affirmation and encouragement. So many people have been hurt by Christians and the church, believe them to be judgmental and close-minded, we sensed that Jesus was directing us to demonstrate his love for people in a tangible way at Burning Man. While we were slowly cruising through the camp with Dustin we began to chat with him about his life just to simply get to know him. Burning Man is all about connecting with people and radical inclusion- yet I began to wonder, who wants to include Dustin, the self-proclaimed “sh*t-sucker” at their dinner table, dance party or bike ride? During our ride, a half-dozen people ran up to Dustin’s truck to ask if he could clean out their RV- while he would sigh and mutter “leave me alone” it was clear that he had become annoyed with festival-goers asking him to clean their RV or assuming he was in charge of the toilet-paper supply in the porta-potties. As we talked, Dustin shared with us that he had been in prison for three years & that the sewage company was the only one who would give him a job after prison. “They gave me a job & then eventually I became manager” he smiled gruffly as Rick and I congratulated him on his achievements. Rick, Dustin & Me outside of our considerably less smelly RV! “How was prison?” Rick asked as Dustin continued to be stopped by people needing RV poo-removal. Rick is able to connect with people in amazing ways, to empathize and invite them to see how Jesus might be working in their lives. Though I know this about him, the question struck me as weird. How was prison? That’s like asking, “how was your colonoscopy?” Yet Dustin still replied, “It was alright. The hardest thing was going three years without a woman’s touch, y’know.” Rick empathized about the difficulties of marriage and lack of physical contact and asked him if he was married. Dustin shared that he had been married three times, that each time had been very difficult & that he hated being lonely but didn’t know if marriage could actually work. Rick began to ask him about how he deals with pain in his life & if he had any spiritual ways of dealing with the pain. “Well, I grew up LDS (latter-day saints; we were pretty close to Utah), but I don’t really go to church anymore. At that point we had arrived at our RV & Dustin hopped out of the truck and started getting the hose down from his truck for the removal process, putting on his gloves and removing the cap from our sewage box. As he got ready, I stood to the side and told Rick I wanted to ask Dustin if we could pray for him, which Rick shared that he had already been thinking about. As he finished up, removing his gloves and squirting anti-bacterial lotion on his hands, Rick explained our hope to give people gifts at Burning Man through prayer and asked if we could pray for him. Dustin seemed surprised, but pleased that we were showing an interest in his life beyond his poo-removal abilities and agreed. As we were praying I felt God urging me to give him a hug. I didn’t feel like it was a big gesture but for a guy who had just shared how lonely he was and how painful each of his three divorces and marriages had been, maybe that’s what God thought he needed. After we prayed, I asked if I could hug him. “Sure!” he smiled as Rick scooted off to get some cash to give him a tip in addition to his fee. I gave him a big hug and thanked him for the ride back to our camp and for helping us with our poo problem. Though it didn’t seem significant at the time, I was thinking about how part of Jesus’ ministry was to care for the “untouchables” in the places he traveled- lepers who were banished from the city, women who were unclean because of their menstrual cycle, people who were physically handicapped and couldn’t walk. The people that no-one wanted to touch, no one wanted to be around. In a very small way, I felt like Jesus was extending himself through me to Dustin- the “sh*t-sucker.” To help him see that God values him, he is worthy of being loved by people and by God and that he is more than the job he does or his painful past. He is worthy of being seen and touched as someone made in the image of God. 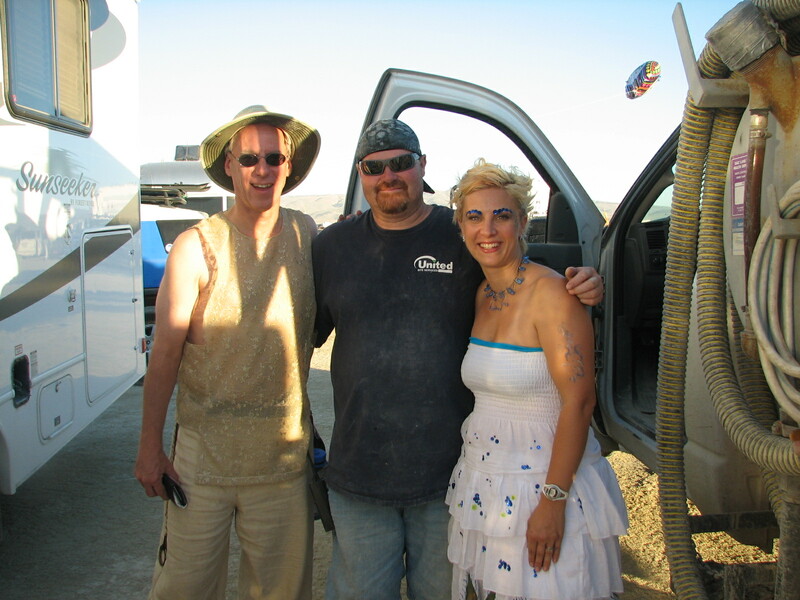 Dustin was one of my favorite people I met at Burning Man. He wasn’t a middle-class white kid trying to escape and play desert hippie for a week, a high-paid exec looking to cut loose or a pseudo-spiritual person that was just looking to consume the next spiritual buzz. He was just a regular dude, trying to figure out how to be happy, stay married and live life well. I think that’s what many of us want- and just like Dustin, it can be hard to find. good for you! I’m so glad you offered to pray for him! What a wonderful gift in the midst of his poo-cleaning. also love this. great story. The kingdom lived out is a beautiful thing. You are such a great writer. I also-like everyone else- loved this story. Can’t wait until I can hear more about your experience at burning man.